TaoTronics TT-SL036 33ft 100 LED String Lights Dimmable with Remote Control, Waterproof Decorative Lights for Bedroom, Patio, Garden, Gate, Yard, Parties, Wedding. UL588 and TUVus Approved(Warm White) by TaoTronics at Result BD. MPN: TT-SL036. Hurry! Limited time offer. Offer valid only while supplies last. The LED String Light TT-SL036 is a functionally versatile, can illuminate your room, creating ambience and mood with a flip of a switch. The LED String Light TT-SL036 is a functionally versatile, can illuminate your room, creating ambience and mood with a flip of a switch. Cost-effective and energy-efficient with direct plug-in power. Ten levels of brightness and dimness control mean you can adjust the lights to fit your needs. The LED lights have an IP65 weatherproof rating which means it can survive humidity and light water splashing. At 33 feet, it can light up a room several times over. 1.The string light could not be extended or connected with other string lights. 2.Do not apply excessive force or repetitively bend the same spot. Dimmable Led String Ligths: Updated Remote Controller with short-circuit protection, 10 levels brightness and adjustable flash/smooth/strobe can create vibrant, dynamic atmospheres. 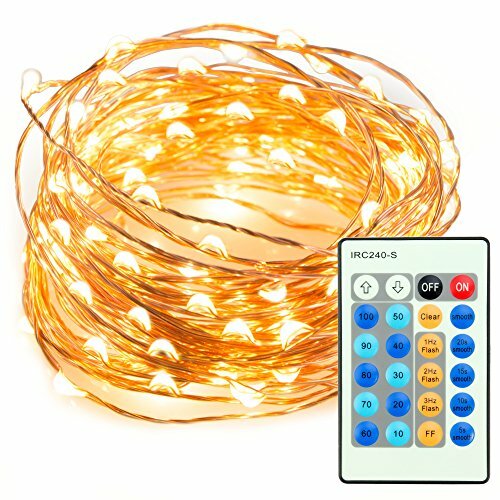 Weatherproof Star Starry Light: Warm white-yellow Mini leds strings creates a warm, joyful, and festive ambience to delight your Christmas ,holiday or wedding. Get creative - mold the copper lights into any shape you can think of. Please kindly note that the string light could not be extended or connected together. Safe and Convenient : The low profile power adapter is easily hidden and is guaranteed with UL certification. Comes with a 5 foot adapter cord and 33 feet of lighting wire with 100 individual LEDs. If you have any questions about this product by TaoTronics, contact us by completing and submitting the form below. If you are looking for a specif part number, please include it with your message.